I did my “undergrad work” at a beachfront college in Santa Barbara, CA, and one of the perks of being located where we were was that it was the perfect place for a touring band with a day off between San Francisco and Los Angeles to park themselves for a night. As it so happened, I had the 8-10pm DJ shift on KCSB-FM on Wednesday nights, and we had an aggressive music director (Eric Stone, now residing in where-are-they-now files) who was a total success at grabbing these bands from the road & plopping them down for a live in-studio set on my show. One such show was released on vinyl & CD as “Radio Cowgirl” by the LAZY COWGIRLS – though this session actually interrupted someone else’s show, not mine. Stone came to me one day in May 1988 & told me that WHITE ZOMBIE were going to come to the station to play on my show, and at the time, that was kind of a coup. 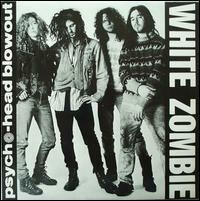 White Zombie were cresting the wave of lots of noise/grunge-era hype emanating from their new low-print-run record “Soul Crusher” and their previous mini-LP “Psycho-Head Blowout”, which was already out of print & a collector’s item a year after it came out. Their sound at the time was a brutal, dissonant clatterfest that was somewhere between out-and-out rocking and completely unlistenable nonsense. Once they arrived at the station, it was obvious that a publicist had put them up to this, because the NY ‘tude they were throwing off was off the charts. The tigress of a bass player “Sean” was pretty friendly, the drummer & longhaired guitarist were completely unmemorable, and “Rob Zombie” – wow. After one song, he sighed and muttered into the mic, “Hoooomph. Why are we here?”, and wouldn’t look anyone in the eye the whole time. And on a nice May evening in Santa Barbara, he was wearing a trench coat and compleat grunge garb. Full-on junkie behavior, but I'm sure that wasn't it. I saw him holding a flyer from the band’s show in Seattle a couple days earlier & saw that the brand-new Mark Arm/Steve Turner band MUDHONEY had opened for them; I asked him how they were & he spat back with condescension “Hooomph. Good – if you like Green River”. You ever met a musician like this before? A full-blown rock star in their own mind? Ironically this guy did in fact became a rock star only a few years later, and I never in a million years would have imagined it at the time given White Zombie’s unrelenting, caterwauling, noise-laden sound. I guess they timed their ascent in tandem with that of “nu-metal”. and went through some serious sell-out sound changes & milked it to the top, but I’ve honestly barely heard that stuff outside of the ubiquitous “More Human Than Human”. On my radio show in '88, however, and please believe me when I say this – they were fantastic. I have a tape somewhere, and I remember that they were absolutely massive toward the end, when they played a wild original that was louder than loud – like the first-LP DIE KREUZEN (here I go again) playing BLUE CHEER backwards, sideways and in Esperanto. Then they followed it up with a cover of KISS’s “Rocket Ride” – and although Kiss might just be the lamest band of all time, it was fantastic. So pumped up from this experience, I took the bass player’s advice and went to their show in Los Angeles that weekend. It was at a floating, no-fixed-address club called “Alcohol Salad”, and this time it was located downtown, in the heart of skid row. Those of you that know LA know that in the 1980s, downtown was not just a terrifying place, it was simply not an area where nightlife ever happened. Anyway, we made it from the car to the club & back alive, and good thing too as White Zombie were (again) on fire. At the time I called it “one of the best shows I’ve ever seen”, which sounds ridiculous now, but I’m telling you, there was so much raw energy & crazed balls-out guitar fireworks going on, I instantly anointed the previously ignored guitarist Tom Guay my new rock hero. Rob Zombie did a couple of complete back flips in the course of the evening’s entertainment, the crowd went wild, and it was really some kind of happening. For one night, we were all New Yorkers. I don’t know what got me thinking about this band today, but I figured maybe you too might have your own White Zombie tales to tell, good or ill.